Have you ever wondered how surviving a near-death experience may change life, as you know it? Shirley Ramos didn’t – until it happened to her. On February 22, 2009, Shirley, full of life, suffered a stroke at the age of twenty-nine. Thoughts of a Butterfly is the poignant result. A beautifully written series of interconnected thoughts and poetry, woven together with introspective narrative, Thoughts of a Butterfly portrays the journey Shirley was compelled to undertake. Reflection on her past choices and future goals creates an inspiring portrait of flourishing self-discovery – a spiritual awakening. Accompanied by photographic images as a gentle guide and depiction of emotional development and understanding, Thoughts of a Butterfly is as beautiful to look at as it is to read. 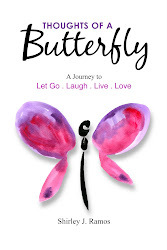 Order your copy of Thoughts of Butterfly book from Amazon's Createspace by clicking here. "I am blessed to be alive."